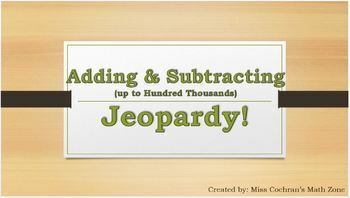 Adding and Subtracting Whole Numbers (through Hundred Thousands) Jeopardy! 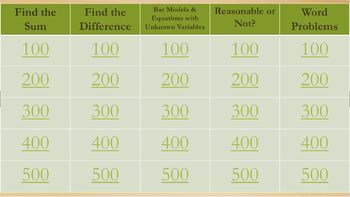 My students LOVE Jeopardy games! 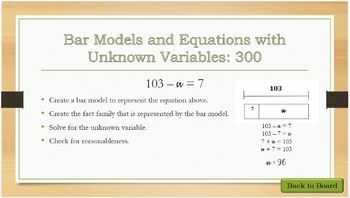 This is a review game that involves adding and subtracting whole numbers through the hundred thousands place, estimating sums and differences (through rounding) to determine reasonableness, as well as building bar models to determine whether addition or subtraction is required to solve a problem. 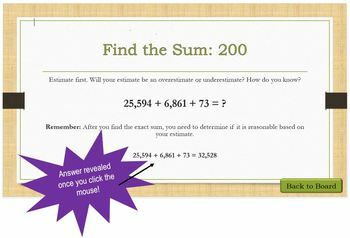 Answers are provided for each question through the click of the mouse.